If there's something that's the opposite of a secret, that's what my love for Christophe Blain's work is. As long as there's at least one English language release of his a year, I'm happy. This year, British publishers Self Made Hero have stepped up to the mark with a translation of Quai d'Orsay, titled Weapons of Mass Diplomacy for English publication. 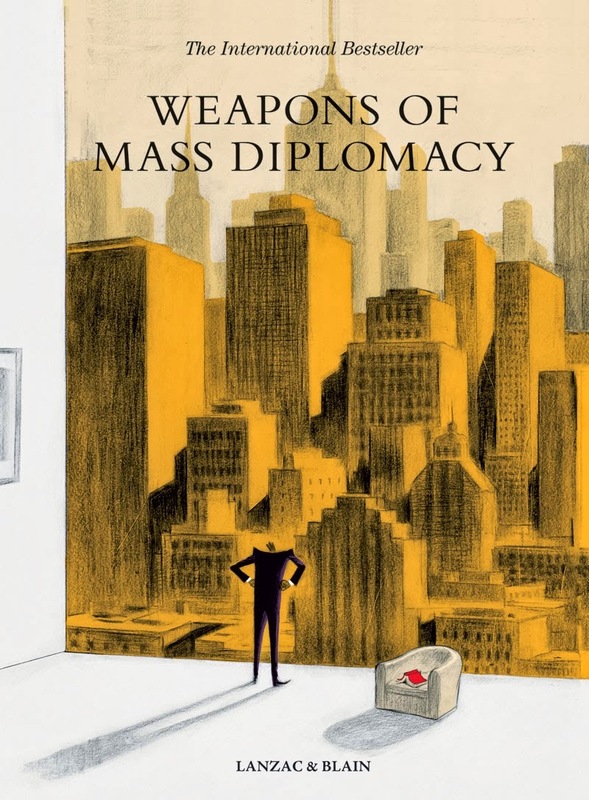 Weapons of Mass Diplomacy is Blain's collaboration with Abel Lanzac, pen-name of Antonin Baudry, former speechwriter and advisor to French prime minister, Dominique de Villepin. 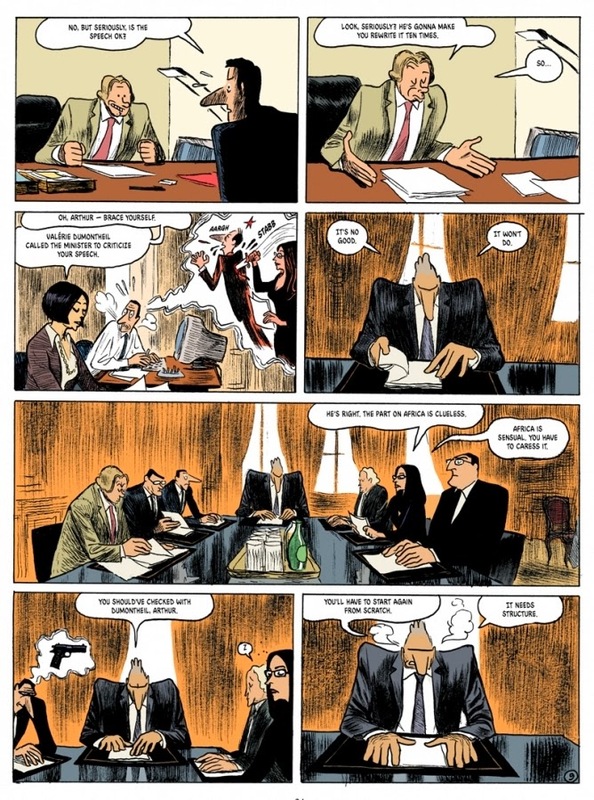 The book is a fictionalised account of Lanzac's experiences in the role at the French Ministry of Foreign Affairs (known as Quai d'Orsay), focusing on the run up to the invasion of Iraq- a political satire which won the Grand Prix award at Angoulême in 2013, and was also recently adapted into a film (the trailer of which you can see below the cut- it gives you a good idea of the tone of the book, I think, and that expressive, slightly ridiculous humour Blain is so good at conveying). I can't begin to tell you how excited I am for this book (due in shops in April). Blain's a bonafide genius, a hugely talented artist, unafraid to collaborate and mix up genres and subject matter, and the topic here sounds really interesting, too. Below you'll find the official summary/press release for the book- I've included it because it's actually rather good, and comprehensive if you'd like to know a bit more, as well as an 8 PAGE PREVIEW from the book, in English. Trust me, this is one book you'll want to check out. 'Paris, 2002. Arthur Vlaminck, a young civil servant, lands an impressive first job as the speechwriter for Alexandre Taillard de Vorms, the French Minister of Foreign Affairs at the Quai d'Orsay. Vorms is no simple man. A refined and driven intellectual, he loves Napoleon, frequently quotes classical poetry and philosophy - and if he bears more than a passing resemblance to the real Foreign Minister at the time, Dominique de Villepin ...well, the authors couldn't possibly comment. As the imposing doors of politics and diplomacy swing open, Vlaminck is thrown into a world of large egos, high stress, and low cunning - and tasked with drafting France's response to a growing international crisis in the Middle East for de Vorm's mission to the United Nations.